﻿ CLF Packaging | When Packaging Really Matters! With many years of packaging expertise we are able to offer an unrivalled service. The owners of the company are actively involved in the day to day running of the business and employ a proactive and hands on approach. 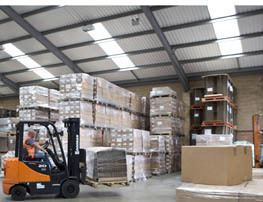 Our stock and serve business is run from 40,000 sq ft of clean warehousing in Warboys on the outskirts of Cambridge. The location offers the tranquillity of the Fens alongside the excellent road links of the A14 to the Midlands, East Anglia and the South. We have our own fleet of vehicles that allow us the flexibility of distribution. Our customers receive the benefit of our stock and serve facility. We can carry bulk bespoke stock and deliver to suit your business needs. This allows you to free up valuable storage space within your own premises; therefore giving you the added benefit of stock being invoiced only upon delivery. We use sophisticated software which provides traceability over all transactions and produces real-time reports. We monitor stock levels on a daily basis and using past history and seasonal trends we are able to make reliable forecasts of future transactions. Our future aim is to expand and develop our business along with our dedicated team of people. We shall continue to maintain the high standards that have helped build our company into what it is today. In today’s world we shall continue to be a positive contributor to our economy and the community whilst maintaining our respect for environmental issues. "Our customers receive the benefit of our stock and serve facility. We can carry bulk bespoke stock and deliver to suit your business needs." Why we are so good! CLF Packaging has an experience which has developed and grown since our beginnings in 1974. From Just In Time to Stock and Serve, we have the flexibility, knowledge and resource to deliver product alongside service that slots in seamlessly within your business. (c) Copyright 2017 CLF Packaging Ltd all rights reserved Packaging specialists for the UK.